Three friends on a beach in Marseille, 29 August 2016. Paimages/AP. All rights reserved. In the aftermath of the Nice attack on 14 July 2016 and the murder of a priest in Saint-Etienne-du-Rouvray on 26 July, the burkini became headline material in France when on 28 July, the mayor of Cannes introduced a ban preventing ‘access to beaches and for swimming … to anyone not wearing appropriate clothing, respectful of moral standards and secularism’. Thirty-one communes passed a law banning the wearing of ‘religious clothing’ on their beach. Of course, this ban did really not target all religions, but was a direct attack against women wearing so-called burkinis, and by extension acted as yet further stigmatisation of anyone associated with Islam. As had been the case with regard to discussing the place of Islam in France, this debate has been very much one-sided: politicians on both sides of the political spectrum have jockeyed for position to demonstrate who would be toughest against what they all saw as a threat: Prime Minister Manuel Valls described the burkini as ‘an affirmation in the public space of a political islamism’, while former president Nicolas Sarkozy denounced it as a ‘provocation’ in support of radical Islam. Jean-Luc Mélenchon, the self-appointed left-wing alternative to the government, felt necessary to single out and essentialise Islam, noting that, while there are bigger issues to deal with, ‘all religions are a problem when it comes to the equality between men and women. With Islam, it is maybe more visible’ – for him too, the burkini is a ‘provocation’ linked to ‘a Salafist religious offensive’. The reaction to the burkini bans beyond France was overwhelmingly negative. Photos of a woman being forced to undress on a beach surrounded by armed policemen went viral and were widely criticised in other countries, allowing for their more ‘reasonable’ forms of Islamophobia to be ignored in the face of such shameless manoeuvres. The ban was initially upheld by the administrative tribunal of Nice before being suspended by the State Council. The decision stated what should have been obvious from the beginning but had become impossible to consider in French politics in 2016: the ban ‘constituted a serious and manifestly illegal infringement of fundamental liberties’ and reminded mayors that the law ‘may only restrict freedoms if there are confirmed risks’, something which clearly was not the case. Despite such strong words, politicians from both sides have continued to surf the Islamophobic wave in France, calling for a blanket ban, with Sarkozy demanding that the constitution be changed to allow such a law to be passed. Yet the ‘burkini affair’ is very much of the tip of the iceberg, as the situation in France in the aftermath of the attacks has become increasingly difficult for anyone associated with Islam, no matter how loosely. Since the Charlie Hebdo attacks in January 2015, French Muslim communities have been placed in a constant state of suspicion and borne the brunt of the state of emergency. Beyond recent events, Islamophobic actions and reactions have been deeply rooted in France’s secular hypocrisy. While many have mentioned the state of shock and fear France has been in following the string of horrific attacks over the past two years, such an argument to justify the latest ban is moot as Islamophobic and liberticidal laws have in fact been commonplace in France for decades. The very act of unveiling a Muslim woman should have resonated as a dire warning to politicians as it was reminiscent of some of the darkest hours of French history. 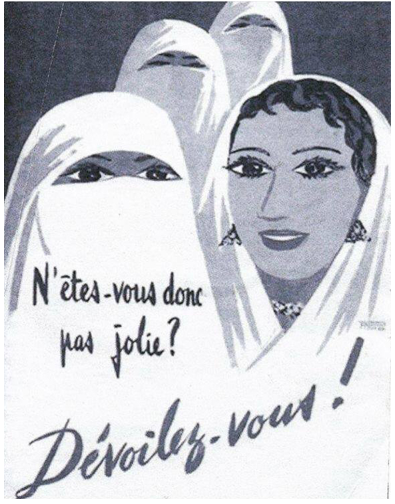 This poster, published in Algeria in the 1950s, shows that French propaganda there was often based on similar ideas. The 2004 law banning the hijab in schools and the burqa in public spaces demonstrated the willingness of the French state to deny agency to Muslim women and girls on the basis that their religion made agency impossible in the first place. Listening to these women was unnecessary; the country of the Rights of Man knew best what was right for its women. While countless laws and polemics have directly targeted loosely-defined Muslim communities in France, many of the defenders of such laws and anti-Muslim sentiment in general have argued that their stance is not based on a racist argument: it is merely about religion. Anyone who has ever denounced Islamophobia in our societies will have been confronted by a barrage of repetitive arguments about what is written in the Quran and the ‘fact’ that hating Islam is reasonable, not a ‘phobia’ (see the comments in this article). Yet, while this theological twist has allowed many to posit themselves as progressive secularists, their claims with regard to Islam and Muslims today are for the most part rooted in typical forms of racism. Islamophobes and anti-Muslim racists, be they anonymous commentators, far right activists or mainstream pundits have in common their stigmatisation of anyone deemed to be part of some kind of essentialised identity. One is applied ‘Muslimness’, and this implies certain innate beliefs/attributes. One is Muslim and, as such, innately suspicious; in turn, this makes it plausible and indeed reasonable to preclude ‘them’ from fundamental rights. In line with traditional forms of racism, it is by removing the humanity of Muslims, proved in this case by their understood innate inadaptability to fantasised (western) civilised ideals, that it becomes possible to implement laws curtailing freedoms we would never accept being removed from ‘Us’. Every citizen is summoned to have an opinion, even though most have never seen anyone wearing such clothing. They discover this bathing suit through a preliminary question: what is it hiding? The consequence is thus the overvisibility of the burkini. As the suspicious nature of the burkini becomes internalised through its disproportionate media coverage, it becomes possible and indeed advisable for authorities to publicly humiliate women and justify the removal of their agency with regard to their choice of clothing or practice of religion, agency enjoyed by others around them and protected by the constitution. The message: be like us or be not. While supporters of such bans often claim pseudo-feminist motives, the result is always the further isolation and segregation of women. The racist rationale behind such laws is all the more obvious as burkinis had no links with any of the terrorist attacks or propaganda in France or elsewhere. Yet even if burkinis had been used in heinous acts such as those perpetrated in France in the recent past, punishing all those wearing this piece of cloth would have remained a racist act as it would have assumed the equation of burkini to Islam and of Islam to terrorism. Yet anti-Muslim racism is much more insidious and widespread. In much of the west currently, being Muslim or simply appearing a certain way, whether through your clothing, the way you look, or the name you bear, is enough to face a barrage of discrimination. Commonly, those deemed Muslim find it more difficult to find a home or a job than their peers with a similar educational background. While this has been very well documented, it has been internalised and accepted as unavoidable, as other forms of discrimination have been. In this racist narrative, it is crucial to stress that the Muslim signifier does not have to come from the individual herself. A particular version of Muslimness, defined by the onlooker in a position of power, not the bearer of the identity, is imposed onto people through various types of generalisation, misperception and stigmatisation, such as the so-called secular and anti-terrorist laws, but also through the media coverage of Islam. In this narrative, Muslims, whether they be defined by religion, name or appearance, are branded as such by those in various positions of power and prevented from expressing their individuality and agency as they become nothing more than what ‘We’ believe Islam is: a homogenous and impending threat. In this hegemonic narrative, the agency of Muslims as individuals is not acknowledged in its diversity but imposed in a homogenised manner, preventing any discussion from taking place. Any denunciation of this racism and rebellion against it is automatically rebutted as being supportive of radical Islamism and thus discarded or even punished. Just as ‘They’ are essentialised as backwards, sexist and violent, ‘We’ are essentialised as civilised, egalitarian and the defenders of human rights. Friday’s State Council decision should be seen as a dire warning for France. While the liberticidal laws against the hijab and burqa were ultimately passed in France, that this one was repealed (for now at least) is a clear sign that yet another line has been crossed in France’s descent towards increasingly racist and even fascistic politics. And yet French politicians have so far continued to fuel the racist sentiment they have played a major role in creating to divert the attention away from their failure to act in other areas. As the stigmatisation of Muslim communities in France has become naturalised through the openly violent state of emergency measures or the more insidious discriminatory practices in day-to-day activities (work, school, housing, etc. ), emancipatory politics appear increasingly out of reach. In the current political context, Muslims are not considered as political and economic actors whose position with regard to growing inequalities and insecurity could place them within the political category of French worker. Instead, they are separated, marginalised, and used as a decoy allowing for the perpetuation of a deeply distrusted system – in France, 9 out of 10 respondents to polls declare they do not trust politicians. As the presidential election campaign ramps up, it seems that Islam will be at the centre of the debates, and that such debates will only relate to the scale of the suspicion to be placed on Islam and anyone related to it. In this cacophony, Marine Le Pen remains suspiciously quiet, no doubt enjoying the mainstreaming of much of her party’s ideas and a return to mainstream politics openly based on a race.